inspired by People in the streets. Abbey Lee Kershaw is the best dressed girl out there for me so I get a lot of inspiration from her as well! signature look I love tights and shorts, docs or creepers and a leather jacket. current favorite wardrobe item Ehmmm my creepers!! random fact I have an obsession with homemade food!!!!! 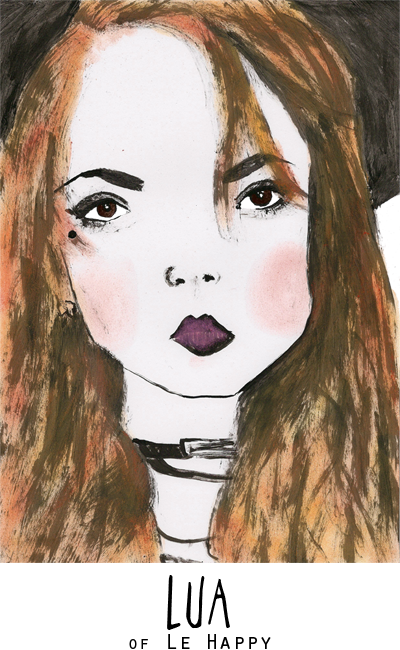 Fancy your own illustrated portrait? Click here. Ohh, she is AMAZING! <3 I only recently found her blog actually, but I've been hooked ever since! Oh my god I love her everything! i love her shorts and doc martens. I love her blog, your illustration is great!